Do you know if your hard drive is about to fill up, crashing your site and corrupting your database? Don’t let your Magento 2 site’s hard drive fill up. If it does, your site will come to an abrupt crash. It may also corrupt your MySQL database, too. 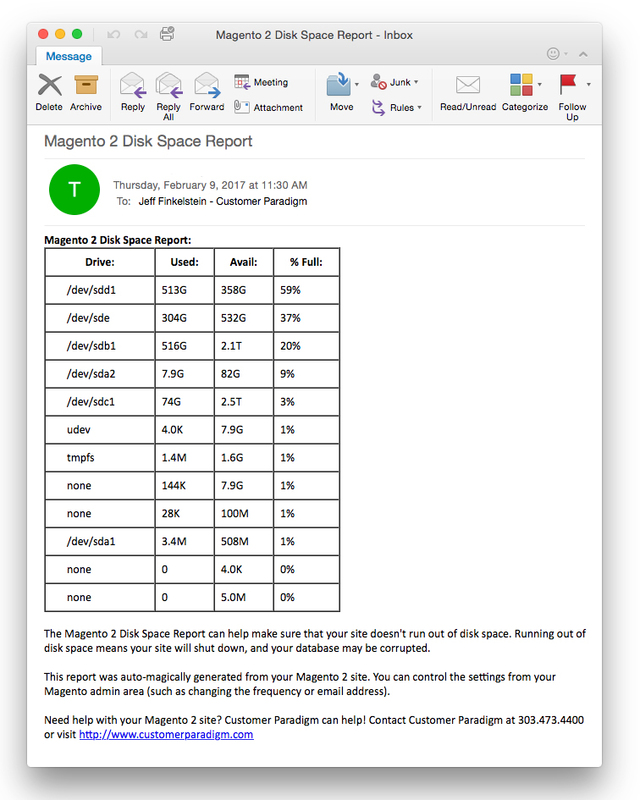 Customer Paradigm’s Disk Space Report is a Free Magento 2 extension. We built this as a way to have an automated system monitor your Magento 2 site for free disk space. We built this because we work on a lot of Magento 2 sites. And we hate when a rogue log file grows and grows and then the site crashes completely. The extension uses your Linux file system to read free disk space, and then will email you a summary of the disk space usage, according to your settings. Instead of relying on your customers to let you know that your site has crashed, this system will alert you right away if your site is close to running out of free disk space. We’re releasing this to the Magento community as a way to prevent Magento 2 sites from crashing due to lack of disk space. Uses your Linux file system to check available disk space. You can set how often you want the system to scan your site for changes (as frequently as every 15 minutes, each hour, each day, etc). 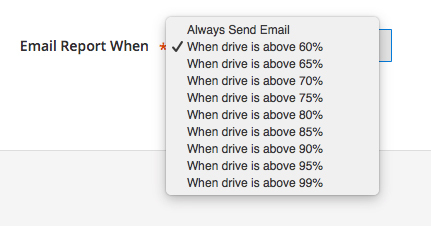 The system will email you if any drives are close to full. The extension has been designed to not conflict with other extensions, and work smoothly with Magento 2. This extension was coded out by one of our top, certified Magento 2.0 developers on the Customer Paradigm team. The code has been peer reviewed by the rest of the department and tested extensively. Pricing:Free! Zip, Zero, Nada. 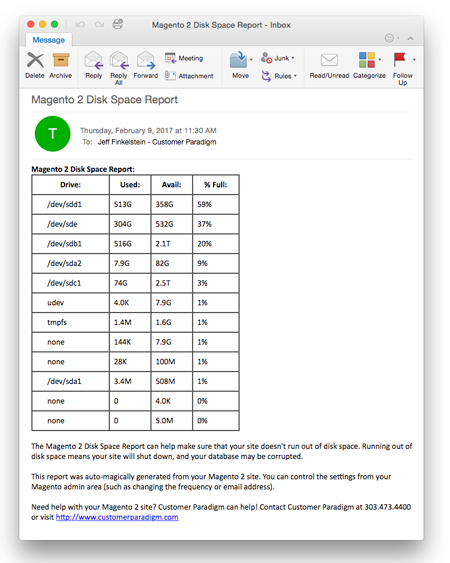 Magento 2 Disk Space Report Extension is free. The end user of your Magento 2 site will not see any part of this extension. If the Disk Space extension does it’s job, your Magento 2 site will continue to run, without unauthorized changes to the site. 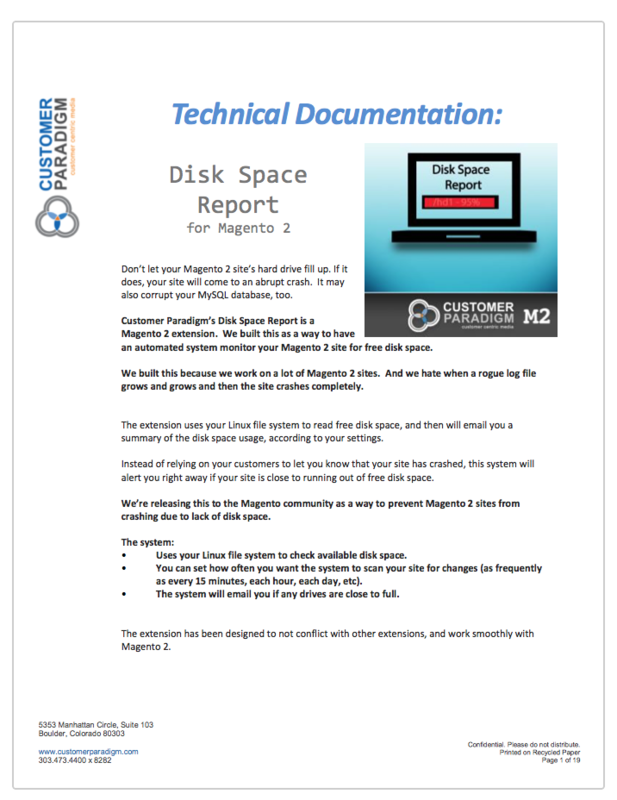 On this page, you’ll select when the Disk Space Report Magento 2 extension will run. If you select “Enabled” then the system will run. If it’s disabled, it won’t run. Second, you have lots of different options to configure when the script will run. We’ve tried to make it as easy as possible to allow you, the admin, to be able to set it to run for maximum flexibility. 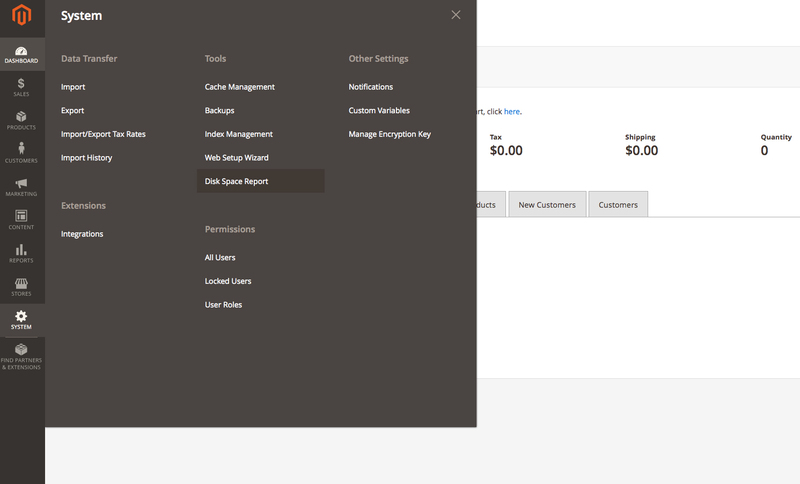 Note: the Disk Space report time settings will use the time zone that you set for your main Magento 2 store. Day of the Week: You can run the Disk Space Magento 2 Report each and every day, or just on specific days (such as Tuesdays). How often should you run the Disk Space report? It depends on how paranoid you are. You’ll get a lot of emails with this method, too. For example, let’s say your disk space is full or getting full around 5:00 pm on Friday. By Monday morning at 9:00 am, the system will have sent you 255 emails (One email every 15 minutes for 64 hours). This may impact your system performance – the Disk Space Report can take up memory resources to run. It might also be an annoying way to fill up your email inbox. If you’re just worried about unwanted changes on your site, run the script once a day at 6:00 am. Why in the morning? Then you have all day to track down a developer and have them fix the site. If you run it at 6:00 pm, then you’ll just worry all night (unless you have developers who are complete night owls and only start waking up at 6:00 pm). For the truly paranoid, use these settings to run the script every 15 minutes. Beware: this will send you a LOT of emails if you have uncommitted changes. If you’d like to run the system every day at 6:00 am, select this setting. Once a week might be more than enough – especially if this is just something you want to run on a development server and keep track of uncommitted git changes. 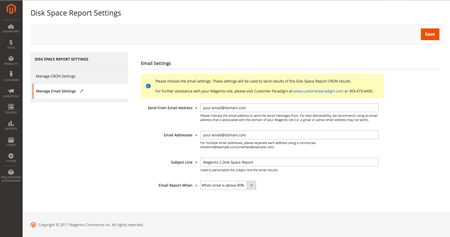 In this form field, you can set the FROM email address of your Disk Space Report. This should ONLY be a single email address. The email address you are sending from should match the domain name of your Magento site. If you use a gmail or yahoo email address, your server probably doesn’t have authority to send on behalf of another domain. In this field, enter in the email address or email addresses that you want to receive the report. For multiple emails, separate them with a comma. Important note: if you add your boss to this email, and your site is close to filling up, your boss will receive these emails. Don’t upset your boss with unwanted emails! 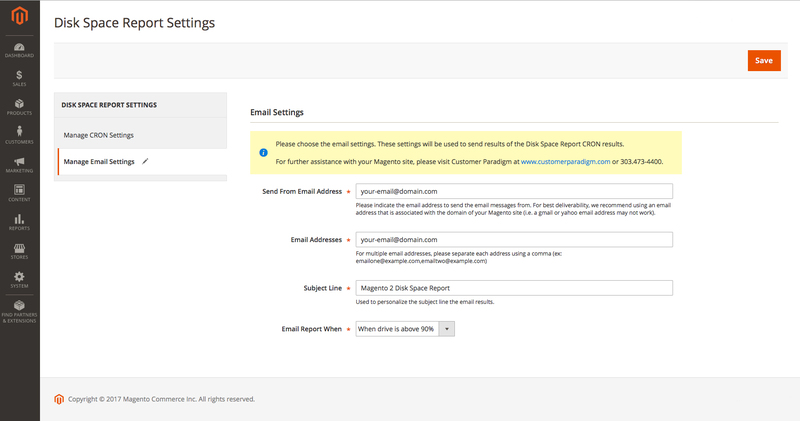 Use this field to set a custom subject line for the email reports. You might want to include the site’s name (if you have multiple websites). Use this selection to determine if you want an email sent every time the Disk Space script runs (i.e. every hour) or only if there are uncommitted changes to the system. Personally, I have the system run once a day, and always send an email. Why? This creates trust and confidence that the system is working and watching. I can deal with one email every single day that says my site is secure. This might be a good way to promote trust and confidence with your boss in your organization. Others might want the system to run every hour, but let them know if there are uncommitted changes. The drawback to this is that if the changes aren’t committed to Git, then you’ll receive an email every hour until the changes are committed into Git. A: Yes, although you may not want to run the system as frequently on a development site. Q: I’m not receiving the Disk Space emails. Why not? First – Cron *must* be enabled and running for this system to work properly. If cron is not enabled, then the system will not be able to be triggered. Second, make sure that the email address you are sending FROM (i.e. in the FROM line) has permission to send from your server. For example, if your server is XYZ-Corp.com, you should likely be able to send FROM info@XYZ-Corp.com. You may need to check with your email provider to make sure that this server is whitelisted. We recommend making sure that the email address you are sending FROM is in your address book in your email program. We also recommend having an SPF record that gives permission via DNS to send email on behalf of the domain. Beyond this, if your transactional emails are sending from the server (i.e. the order confirmation emails), then Disk Space should be able to send properly as well. Make sure that sendmail or another outbound email sending program is enabled. Q: Can my site still crash with this script running? A: Yes, your site can still crash due to many other causes, including running out of disk space. This is a helpful tool, but will not prevent or clear out space on your site. Q: I don’t have Cron installed on my site. 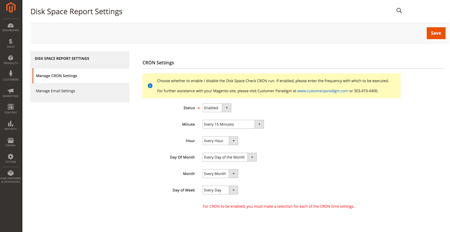 Can Customer Paradigm help me install cron on my Magento 2 site? A: Yes… we’re happy to help on a consulting basis. Please contact us at 303.473.4400 or Visit here to have a real person contact you now >>. 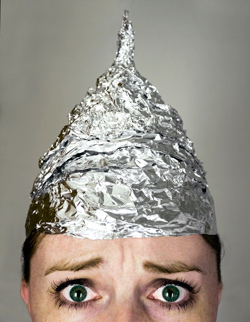 Q: I don’t understand what the report means. Can Customer Paradigm help me understand the report? Before using the order comments extension in your Magento 2 store, it must be properly installed to notify your Magento site to the existence of the extension. If you have successfully processed these steps, you should now see the Magento 2 Disk Space Report extension active in your admin area (displayed above). The Disk Space extension does add in an additional database table called cp_diskspacereport_cron into your Magento 2.0 store. You may remove this table directly from your mySQL database.